Hello dear rose friends … A week of extreme weather variables – minus 2 frosts which burned the new tips on the oak trees and totally scalded the ‘Crepe Myrtles’, then 32 degrees on Sunday while I was planting a new section for roses wearing a singlet and getting sunburned; now it’s raining and cold ….. Whether the weather be fine, Or whether the weather be not, Whether the weather be cold, Or whether the weather be hot, We’ll weather the weather Whatever the weather, Whether we like it or not! GRA’S STUFF … Different week, different heading … you’re in for a treat either way! Q. What has to be broken before you can use it? A. An egg! Speaking of which, what a great healthy food package. 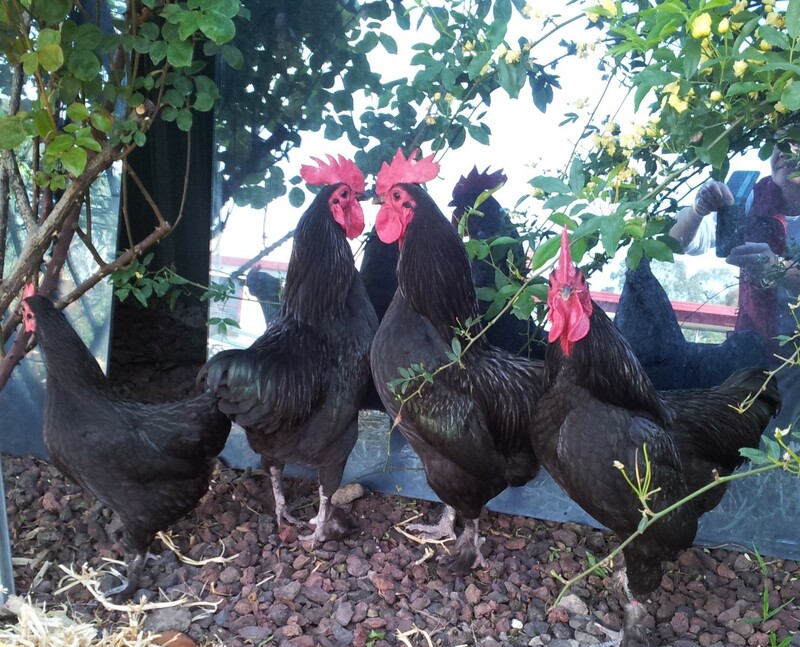 If you have owned fowls, you’ll understand the joy they are to sit and watch for half an hour .. see their pecking order, their habits – some extrovert, some introvert and some always hungry … like ME !!! and the one who is always last in the pen. · FRESH, CLEAN WATER AT ALL TIMES! · Shell grit or stone dust – leave in trays and watch how they use these! 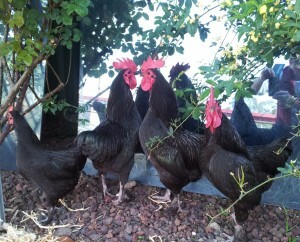 True free-range eggs are sooooo delicious and so very good for you! Along with eggs, to grow your own veggies and salads is the best guarantee of good healthy food – fresh is magic for your body and soul – the gardening side of all this manifests a healthy mind and earth! Companion planting is so good for the environment – grow carrots, small bush tomatoes, silver beet, lettuce and lots of different herbs among the rose bushes. Place a bowl of water with corks floating in it so the bees can have a drink! Grow the heavy feeders together – cabbage, cucumbers/pumpkins/melons, sweet corn and tall tomatoes – when they’re done, follow up with potatoes and legumes to give natural nitrogen back to the soil or compost that section of garden with layers of straw, leaves, fowl manure in thin layers together with layers of herbs like tansy, yarrow and nettles to get the microbes working … yes, my word, they really dooooo! NEW ROSE CATALOGUE … I am in the throes (and woes!) of putting together a rose catalogue with photos of roses and invite you to send me your favourite NAMED rose photo to make a really sensational contribution to the back page feature – all different roses! 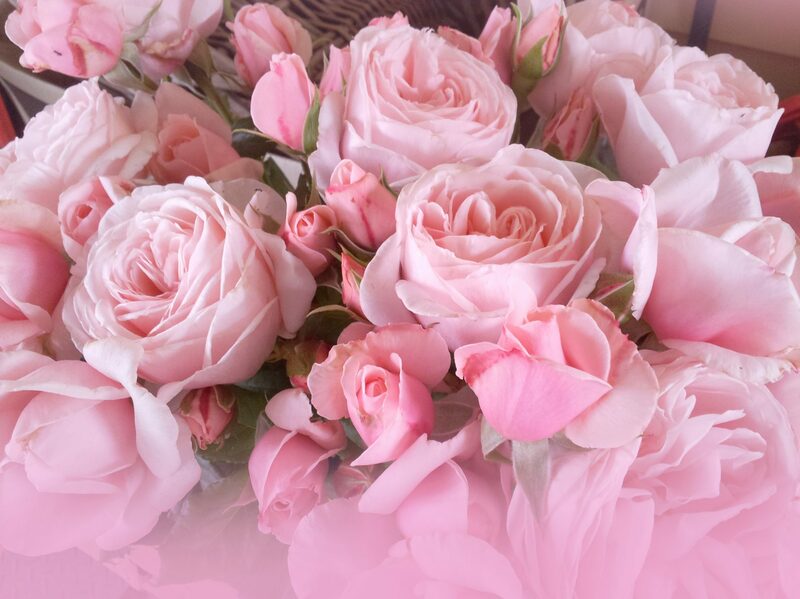 Trying to sort just 50 roses to be featured in this Catalogue is wrenching – so many glorious roses with wonderful attributes that I would love to share but they’ll have to wait until I write the book of my dreams! Hello dear rose friends … there were a lot of enquiries about the ‘blind shoots’ which I mentioned in last week’s Rose Rambler. Because it was raining here, I couldn’t go and take a photo so I did a google search … fabulous photos immediately! Do take a look because it’s another interesting learning experience for rose gardeners and the sooner you take the ‘blind shoots’ off the rose, the quicker it springs into rose bud development! Graham used to love exhibiting roses and would encourage you all to have a go at it – they have a special section for Amateur Rose Growers – good fun and seriously, even better when your rose is awarded a prize! Have a go at it!!! IT ONLY TAKES ONE … That’s one hot northerly wind to radically change the beautiful rose blooms into a pretty ordinary mess because those winds bring with them the ‘THRIP’ … take a close look at these pics and you’ll never, ever, call an aphid a THRIP again! Aphids cause their own sort of havoc and they are destructive on newly forming rose buds but the THRIP do a lot of damage too and there’s very little we rose enthusiasts can do but remove the spent/damaged blooms and wait for the next roses. HERE’S “GRA’S RAMBLE” … (same name as last week I think …? Starts with the joke!). Q. What do you call a horse that lives next door? A. A neigh….bour! Eco-Oil (what a great Aussie invention) made from the Melaleuca, Eucalyptus and Canola Oils right here in Australia and now they’ve added HIPPO’s that attract good insects! CLEVER! This product will control scale, 2 potted mite (look real close in hot weather), aphids, white-fly and citrus leaf miner and spreads liquid seaweed beautifully over the plant leaf and stems. There is NO spray resistance, NOOOOO withholding period and it’s safe for EVERY plant! It is registered ORGANIC (Cert No. A1222). WARNING: DO NOT USE IF TEMPERATURE IS GOING TO BE OVER 28 DEGREES! Saves digging which saves your back! Q. What’s a horses favourite sport? A. sTABLE TENNIS !!!! Did you know that research has shown that gardening for 30 to 45 minutes per day is the equivalent exercise to walking 3kms for 40 minutes or cycling 8kms in 30 minutes ..? That’s not just out walking smelling the roses ….!!! However, just out walking and smelling the roses will add years and years of goodness to your life and change your day .. every day! MOON PLANTING GUIDE FOR THIS WEEK … Don’t plant anything on the 19th October. The best sowing and pruning days are all day 20th and 21st; from 1.40pm on the 24th and all day on the 25th and 26th. Best harvest days to 5.30pm on 19th; all day on 22nd and 23rd to 1.35pm on the 24th … NO SOWING between 27th October and 2nd November and the very best weeding days this month are all day on 27th, 28th, 29th, 30th and 31st ! There will be no excuse for weeds in your garden during Cup Day Holiday in early November and I promise you, they will stay away for longer if you eradicate them on the nominated days! Do it and hold this calendar through to the end of this month – no guide next week! IN CLOSING … Have lots of happy moments in your rose garden this week … remember to be quick to forgive and love unconditionally … just like dogs do! Hello dear rose friends … Did you have an adventurous and creative time in the rose garden this past week … sure hope so! I planted my bean seeds – just to be pedantic, I did it on the no planting days and then came along, in the same soil zone, and planting in between those seeds on the moon planting days. Yes, of course, I marked them accordingly!!! Best sowing and planting days: tomorrow 11th and then best sowing/pruning days from 7.10am on 15th, all day 16th to 11.20am on 17th. No sowing on 12th! As an extension to this, do some of your own research into when to have your hair cut – I know for 100% that there are times when, after a hair cut, my hair grows faster and there are times when it grows more slowly – I’m sure it’s relative to the same principles as when to remove weeds or prune according to the Moon phases. I’m too busy mowing lawns and pulling weeds to do the research – maybe if you’re sitting at the computer and curious, you might do the research for all of us and I will pass the information on! STATE ROSE & GARDEN SHOW … Yes, of course you’re all right … I got the date wrong and it is definitely SUNDAY, 1ST DECEMBER – we’ll attach the poster to remind yourself to take a day out and visit the State Rose Garden at Werribee … we’ll be there! Thinking of using manure in your compost or as a mulch for the rose garden? Horse manure is readily available in country areas and if you’re taking a drive out here, go along some of the minor roads and you will see gate signs ‘HORSE POO $2.00 A BAG’ (sounds a bit like Mary Poppins!). Q. What do you call a pony with a sore throat? A. A little horse (hoarse). Back to the compost … add all sorts of manures – horse, cow, poultry, pigeon, etc. to a mix of lawn clippings/straw/lucerne/leaf litter and leave for 4 weeks; water every 3rd day to get the microbes and worms working! This rapid time of Spring growth needs feed, feed, feed but in small amounts, often! Liquid fertilizing is great and you can make your own ‘green manure brew’ by placing weeds and herbs in a hessian bag and plunging in a drum of water – dunk the bag up and down every day and within 4 weeks you can water this brew at the rate of one part to ten parts water over all plants – parsley is great to add because it adds calcium which plants need! Add liquid seaweed to the mix and you’ll apply up to 70 minerals as well! Tomorrow 11th and then best sowing/pruning days from 7.10am on 15th, all day 16th to 11.20am on 17th. No sowing on 12th! faster and there are times when it grows more slowly – I’m sure it’s relative to the same principles as when to remove weeds or prune according to the Moon phases. State Rose Garden at Werribee … we’ll be there! (another new name and one day, just for the fun of it, I’ll type it exactly as it is written for me – you can try and decipher it … the funniest joke you’ll ever read!!! But meantime, I’ll correct it and make it legible for you to enjoy and take heed of … Diana)Thinking of using manure in your compost or as a mulch for the rose garden? Horse manure is readily available in country areas and if you’re taking a drive out here, go along some of the minor roads and you will see gate signs ‘HORSE POO $2.00 A BAG’ (sounds a bit like Mary Poppins!). Q. What do you call a pony with a sore throat? A. A little horse (hoarse). 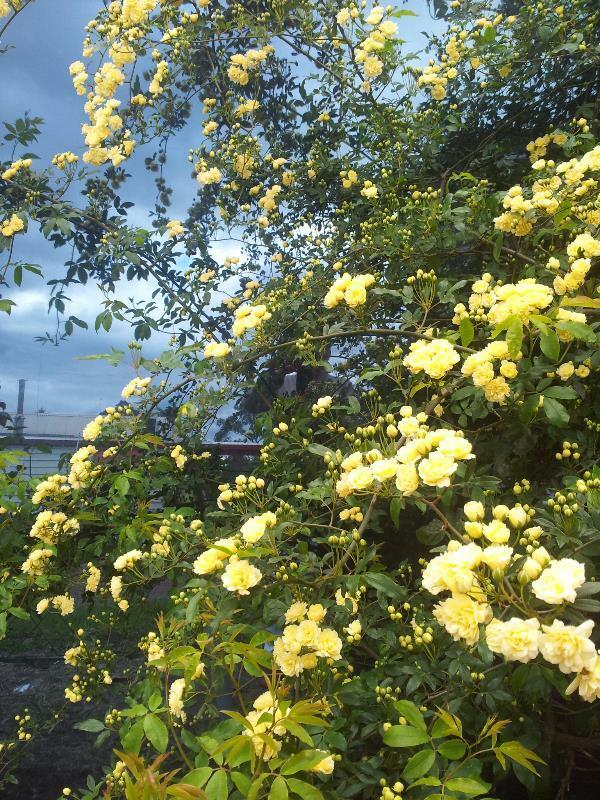 We are so lucky here in the southern states with regular rainfall since the end of the long drought… spare a thought for our northern rose gardening buddies who grow the most glorious roses in the toughest of conditions! Laurel sent me this photo of the magnificent Maurice Utrillo. Hello dear rose friends … well, the race is on – which roses are going to be the first to flower in your garden? Here at cold Clonbinane where we have had two frosts this past week, the old-fashioned roses are winning … Rugosa Scabrosa, Stanwell Perpetual, Mrs. Fred Danks and Nancy Hayward with the modern rose winner, Gold Bunny doing as expected … the first to flower in most years! How exciting and how beautiful and how very lucky we are that we all love roses – I think we’re in for a stunning flowering season, the rose buds are so pumped full of deep soaking rain … sorry to our far north friends who are experiencing drought!!! 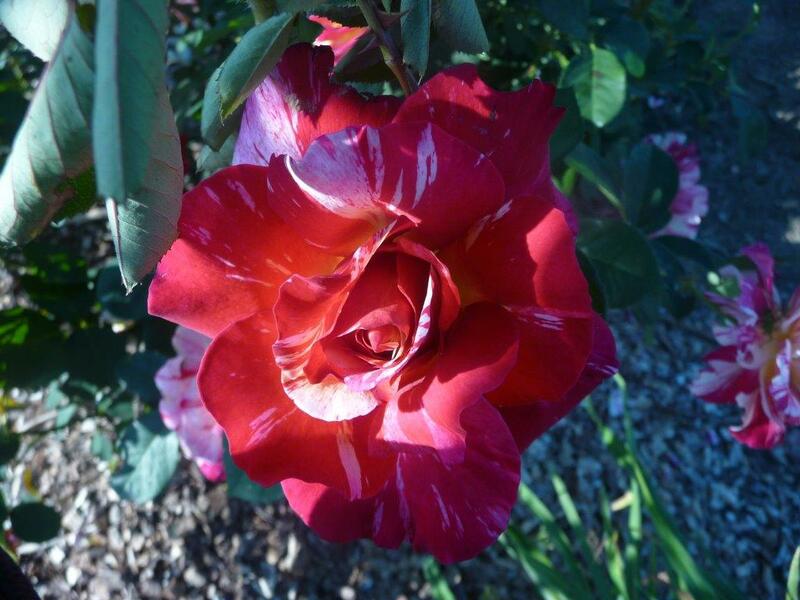 Because of all the humidity, it is imperative that you continue the rose spray-maintenance program – people who are continuing with this program on a fortnightly basis are enjoying their roses … no black-spot, no aphids! If the aphids have beat you to the punch and your roses are covered in them, you need to add 20ml of Eco-Neem to the above recipe for quicker, effective control. GRAHAM’S INPUT … What about Spring? It is a time for massive growth on all plants .. I MEAN MASSIVE! Go for a drive and see the GREEN – it is the most relaxing colour of all of Mother Nature’s colours. 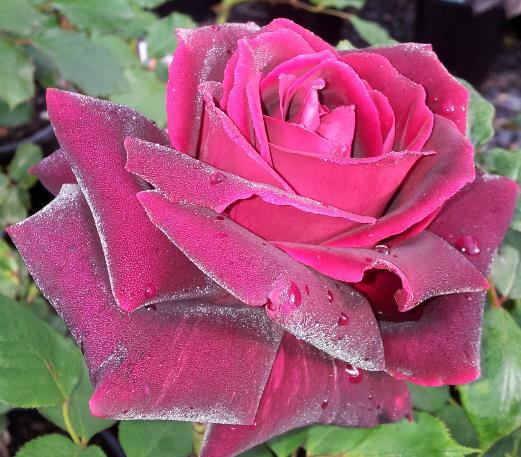 Used fortnightly on your roses there will be 30% more flowers than normal! Just mix ¼ cup liquid seaweed to a watering can and pour over all the plants … as Diana says: JUST DO IT! MOON PLANTING AND BEST GARDENING DAYS … If you’ve spent the last couple of days weeding, you’re totally in sync with the moon and the weeds will have pulled up very easily. Continue weeding and get your hair cut until 1.00pm on the 4th October. Don’t bother sowing anything on 5th October. Best sowing/planting days: all day on 6th, 7th and 8th; all day on 11th. For the sceptics, plant some seeds on 5th and 12th October but please, also plant some seeds on the recommended days and you be the judge of which plants perform and produce the best and which plants require less management for pests and disease. Please have a go at this and if there is enough interest in this gardening method, I will guide you through October in next week’s issue of the Rose Rambler. Keep us posted through www.allaboutroses.com.au or simply email your thoughts to info@rosesalesonline.com.au – we enjoy your feedback.